Improper disposal of household paint cans is bad for the environment, potentially dangerous for sanitation workers, and—in some localities—subject to fines. Here's how to do it safely. No matter what you’re painting—your home’s exterior, the living room, or the dresser you recently bought secondhand—every project seems to leave you with a frustratingly minute quantity of leftover paint, usually much too little to keep for future use. So how do you get rid of it? Well, there are several ways to dispose of paint. The best method depends on the type of paint in question. Read on to learn how to dispose of the three types of paint most commonly used in homes—latex, oil, and spray paints. Due to environmental concerns, leftover latex paint can neither be poured down the drain nor thrown in the trash. If there’s really only a tiny bit left, either air-dry it or use up the remainder on some cardboard. You can then recycle the empty paint can, if not through curbside pickup, then at a local waste facility. If there’s more than a little paint left, take action to harden the paint. You can try materials you have on hand, such as sawdust or scrap paper, or opt for a waste paint hardener. The latter is readily available in hardware stores and home centers. Simply mix the hardener into the paint, closely following the instructions provided. Let it stand for the recommended period of time, after which the paint should be hard as a rock. You can now throw the can away (but you cannot recycled a can with hardened paint). 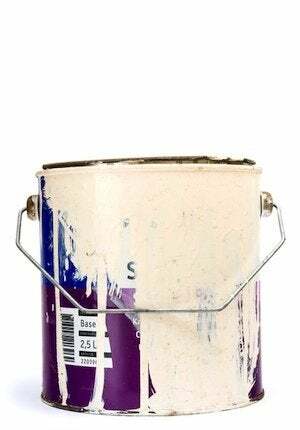 If it’s a full or nearly full can and you simply no longer want the paint (and you cannot return it to the store where you made the purchase), call your local home resale store or a charity with an office nearby. Oil-based paint qualifies as hazardous household waste (HHW). As such, it comes with limited disposal options. 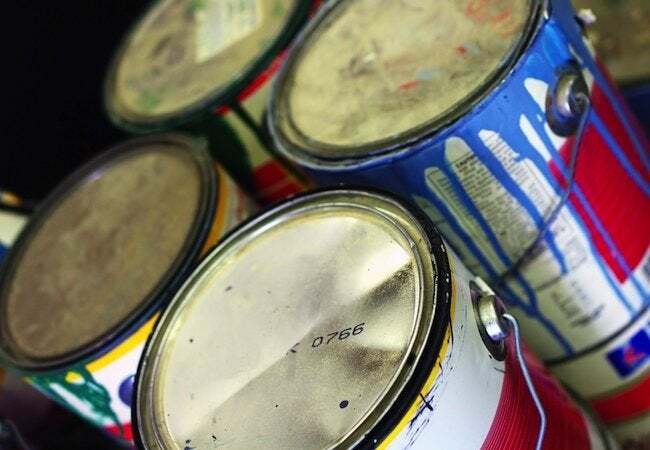 You may recycle a completely empty can, but things get tricky if there’s paint left. If you’re prepared to spend money to avoid a hassle, you may want to contact a hazardous waste vendor. Alternatively, consult your local government for advice, or contact the big-box home improvement store closest to where you live. In many counties, there are drop-off dates on which HHW material is accepted. A full (or nearly full) can of oil-based paint would be much easier to donate than to dispose of properly. Half-full cans of spray paint are potentially dangerous; they can explode under heat or pressure. It’s important not to throw out a can until it’s completely empty. Spray the remaining contents on a piece of cardboard until you’re certain there’s nothing left. Once empty, add the can to your regular recycling. As you can see, disposing of paint properly isn’t always a breeze. One thing is certain, however: No matter the type of paint, it’s easier to deal with an empty can than with one that’s half full. So if you’re stuck with leftovers, you’ve now got a very good reason to get started on that painting project you’ve been thinking about!